Internationally acclaimed photographer Thomas Roma, a professor and director of the undergraduate and graduate Photography Program at Columbia University School of the Arts, will present a visual and poetic journey of 1950s northern New Jersey in his talk, "Recent Works: Photography Through the Lens of Thomas Roma," on Thursday, Nov. 5 at 12 noon in CM 110. More here. Yoga classes have been extended through the semester. Wednesdays, 12 to 1 p.m. in the main gymnasium. Bring a mat. Oct. 29: Blood drive at the Blood Mobile of the Community Blood Council, parked in Circle 6, by the Student Center & FA Building, 9 a.m.4 p.m. Bring a Photo I.D. Nov. 4: Lecture by Rider Prof: "On Life Support: The New Jersey Labor Movement in the 21st Century," 12 noon in CM 107. Nov. 12: Community Open House and Board Report, The Conference Center at Mercer, 4:30 to 7 p.m. Please sign up now and help spread the word! Nov. 12: Holocaust Center film "Weapons of the Spirit," 12 noon in CM109, followed by panel discussion. Nov. 13: Staff/Faculty in Football Classic, 4:30 p.m. Email Francis or Craig. Hundreds of students and community members learned about careers in science at a Science Fair Oct. 22 at the James Kerney Campus. The fair was made possible by a grant from the Delaware Valley Innovation Network (DVIN) of Philadelphia, which promotes a skilled and talented life science workforce in the Delaware Valley. MCCC faculty member Linda Gaylo applied for the grant and organized the event, which was designed to promote science as a career to those who might not otherwise learn about opportunities in fields such as biology, chemistry and anatomy. More here with photos. The college received the "Community Service Award" at the Renaissance Ball of the Mercer Regional Chamber of Commerce on Oct. 24. "We recognize and admire the college's activities and programs and the far-reaching impact they have had on individuals, businesses and families that were educated, trained and involved with the college, particularly at the James Kerney Campus." said Michele Siekerka, Chamber president. Proceeds from the event help support the Arts and Business Council of Trenton, and the YWCA of Trenton. MCCC Board President Rev. William E. Coleman, Jr. and Dr. Beverly A. Richardson, former vice president for college advancement and JKC provost, were both honored at the NAACP awards dinner Oct. 25. Also honored were MCCC alumni Zane Dion Clark, Sr. (Community Service Award), Paul D. Mclemore, Sr. (Legal Award), and Hazel Stewart (Community Service Award). Kathy Paluscio says, "On Wednesday, October 21, in the Student Center Quad, under a perfect sky, a group of 15 students from all majors gathered to present the third annual Public Speaking Fall Festival. This year the festival got a new name, 'Survivorfest 09!' a blend of heartfelt speeches, music, comedy, free snacks, prizes and a few fake speech-anxiety attacks. Amid fluttering streamers and electric guitar, one by one, 15 students who had successfully completed CMN112. Mercer's highly transferrable Public Speaking Course, and hungry to show off their new skills, crafted humorous and very touching messages for the crowd." Tith the help of Prof. Kathi Paluscio, Director of Student Activities Danielle Garruba, the Student Activities staff, Student Government Association, Media Services and Facilities staff, the student hosts rolled out quite a welcome for the 80 or so students, staff and faculty who stopped by. More here with photo. 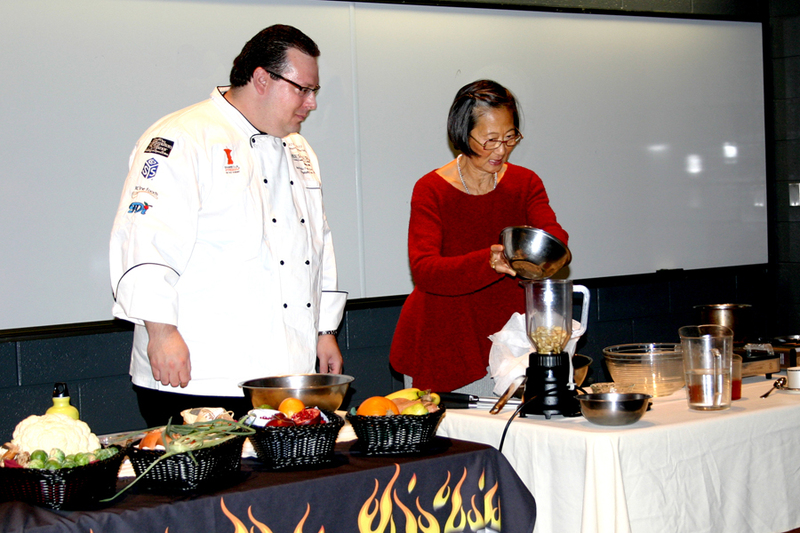 Author of three cookbooks, world-renowned chef Su-Mei Yu gave a presentation at MCCC on Oct. 23. A specialist in Thai cooking, Yu demonstrated how to make almond milk, and gave audience members a sample. Photo here. Click here for the list of job openings on campus. Get an update on the progress of our sports teams here. For the MLink Calendar of Events click here. MCCC NEWS CLIPPING SERVICE: To view most MCCC News Clippings online go to http://www.burrellesluce.com/ and in the upper right hand corner fill in the Username (7965) and the Password (news), then click on "Media Content." Click here for all past issues of eNews@MCCC. This newsletter is designed for and e-mailed to external constituents, including alumni, trustees, foundation and advisory board members, and other friends of the college. Please help us build our lists. To have someone added, send advisory board and friends' names and e-mail addresses to zarrillr@mccc.edu. Send alumni names and e-mail addresses to humphrew@mccc.edu. To have your upcoming event listed on the MCCC calendars, contact Brad Kent (ext. 3772). To request internal or external free publicity for your event, please fill out the request form here, or e-mail the Public Information Office giving details and contact information: Saveria Symons, ext. 3736, or Wendy Humphrey, ext. 3729. For external publicity requests, four or five week's notice is needed. Click here for guidelines on how to request publicity. Click here for information about the services of the Public Information office. MCCC's E-Bulletin is published by the Public Information office, AD 113. E-mail symonss@mccc.edu or call ext. 3736. Please help us keep the college community informed. Your opinion is always welcome. What do you want to read about in future E-Bulletins? If you find a typo or error please let us know so we can correct it online. If you will be leaving the college and would like to continue receiving this bulletin, please send your new e-mail address to symonss@mccc.edu and ask to be added to the "retirees" list.